Climate change deniers sparred with scientists despite rising global temps, tides and turbulence. The stock market bounced to the beat of tariffs and the whims of tweets. And White House hirings and firings competed with indictments and threatening impeachment. What’s a poor earthling, small investor and single voter supposed to do? You could let the pending “award season” and its myriad of celebrations that honor the popular arts cheer you up; that is if you can stomach the inanity of the Golden Globes and Peoples’ Choice Awards that steal some of the limelight while fogging the stage. At least these escapes from reality give the creative class its due and give us a chance to look back at 2018 with something more than a jaundiced eye. Yet, patrons of the visual fine arts will find little recognition of the “best” on the national front. On the local scene, the Omaha Entertainment and Arts Awards bundles the visual arts along with music and theater in the Metro to give the fine arts a small place at the table. 2018 winners will be announced Jan. 27 at the OEAA event at Slowdown. To augment this shortcoming, for more than a decade the A-list below has featured the most significant visual art events and exhibits of the year to provide not only some deserved recognition but a bit of an archive annually where virtually none exists. As always the A-list reflects mainly the opinion of yours truly aided and influenced by at least four other writers who include their preferences in the online version of this year-end review. Our choices are subjective, and we cannot claim to have seen all of the shows in 2018, but from a list of well over 100 exhibits, more than 50 were nominated for recognition. That said, our reviews are based not only on considerable face time with the art, but with research and interviews with artists and curators where applicable to help gain perspective. Omaha’s own Ed Ruscha, a major contemporary American artist, donated 18 of his works to the Joslyn Art Museum along with 20 additional pieces by other significant artists from his private collection. The above donation, along with a promised gift of 50 works from the Phillip G. Schrager Collection of Contemporary Art, would make a worthy display in Joslyn’s recently announced expansion of its gallery spaces to be designed by architectural firm Snøhetta. Metropolitan Community College added a new full wing at its Elkhorn Valley campus for its art classes as well as expanded gallery spaces. The Kaneko hired a new executive director Stephan Grot who replaced outgoing director Chris Hochstetler, who coordinated such outstanding multi-disciplinary exhibits as Reality,Light and Kinetic during his short tenure. Bemis Center for Contemporary Arts also announced a major addition to its staff: Rachel Adams as Chief Curator and Director of Programs. 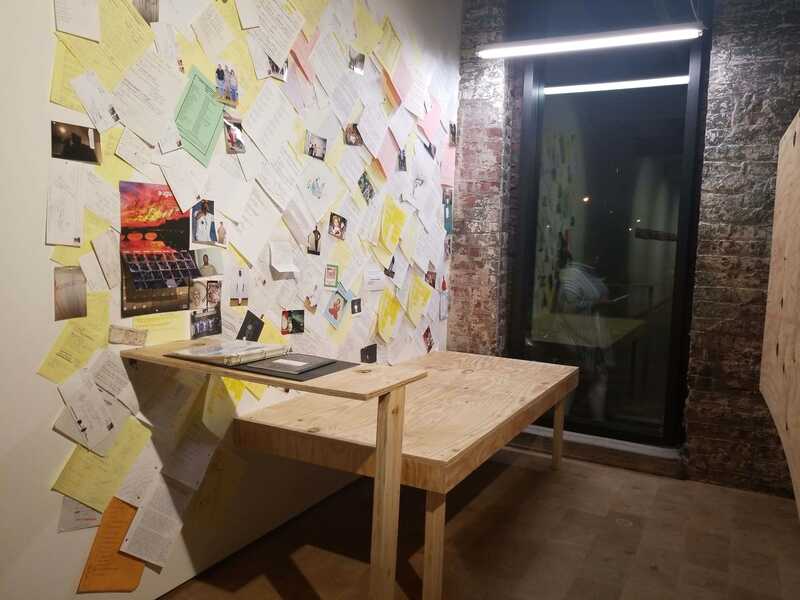 Darger HQ gallery, after a successful, influential presence on Vinton Street due mainly to its founder Launa Bacon, closed its doors and reopened as the aptly named non-profit Public Access Press co-founded by Erin Foley and Peter Fankhauser. For details go to publicaccesspress.org. Omaha Creative Institute has changed its name (not necessarily for the better unless you think Amplify Arts a better recognition ID brand than I) but fortunately not its mission to “build a stronger Omaha through the arts.” Check out the particulars at amplifyarts.org. Connect Gallery survived a Leavenworth Street traffic reno and parking nightmare as UNMC continued its expansion and, despite rumors, will stay open into 2019 and beyond. On a sadder note, the Metro marked the passing of three artists and/or supporters of the arts: the very popular artist/musician Jerry Jacoby and his opposite in personality and style, the highly regarded Lincoln Realist painter/drawer Robert Weaver; and last but not least, Howard Silberg, long-time collector/supporter of the fine arts, Omaha Symphony, Opera Omaha and UNO Friends of Art. But maybe you remember him best playing host at Modern Arts Midtown gallery openings handing out glasses of wine and his homemade biscotti. Before we go over the A-list and its honorable mentions, a shout out to the following for adding something special to the Metro arts scene the past year: public art seldom gets the recognition it deserves but this year Watie White, with his 100 People project along with Brent Houzenga’s own work, made a substantial contribution to Benson Out Back, an alleyway improvement project. Nolan Tredway and Hugo Zamorano, with their mural in Little Bohemia, brought art to the community outside the box. Lead Artist Reggie LeFlore designed a mural inspired by the three colors of the Pan African flag, reflecting the heritage and future of the North Omaha community. A collaboration between the Union for Contemporary and Omaha Small Business Network, the mural is on the north wall of the Styles of Evolution building at 2522 N 24th St.
A special Sustainability Award to the single most inventive and alternative venue in the Metro, Project Project, found by owners Joel Damon and Josh Powell after the Bemis Underground was lost to posterity. Project Project had another significant year in the Underground tradition with such exhibits as Larry Buller’s outré Rough Trade, highly decorative, phallic slip cast ceramics with gay and religious iconography “that would blend in perfectly with anything in grandma’s China hutch.” And a personal favorite, Lest We Forget, by Federico Perez, which included woodcuts and mural on a variety of dark projects. And as a final example of Petshop’s versatility, to coincide with Benson’s newest entries in Public Art in 2018 mentioned above, the gallery coordinated Related Histories, an exhibit featuring the works of Watie White and Brent Houzenga. The next group of exhibitions either met or exceeded expectations while living up to their show and curatorial statements. The following were the most significant exhibits written and/or seen by Reader’s arts editor and staff. At one end of the spectrum of this year’s A-List, Home Sweet Home was an exhibition of more than 50 paintings at The Little Gallery in Benson (doing big things) by visual artist Katie B. Temple that were inspired by unoccupied homes in Omaha. Temple has gone from emerging to a current nominee for Best Visual Artist according OEAA 2018. Her latest work is a lesson in minimalist art with a maximum return and a lot of potential. 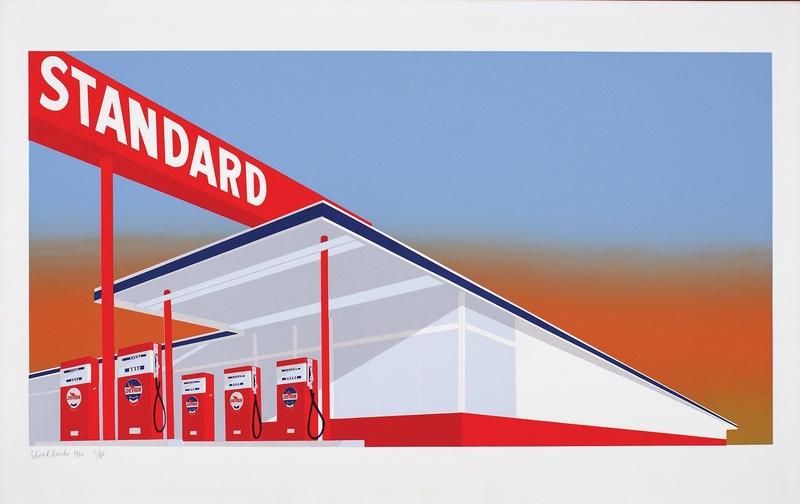 Perhaps another bookend then would be Word/Play, the first major exhibition to feature internationally renowned artist Ed Ruscha in his home state of Nebraska. This retrospective exhibition brought together prints, photographs, and artist books dating from the 1960s through 2015, complemented by a selection of major paintings several of which illustrate his motif of ambiguity. As mentioned before, textiles was a go-to medium for many artists in 2018, but the two most successful exhibits of fabric art had to be Parallel Worlds by artist Shea Wilkinson at Gallery 72 and India Through Beginner’s Eyes by Michael James at MAM which otherwise had very little in common other than mastery of their art…and their journey. A first time traveler to India, James’ meticulously crafted “travelogues” were layered with patterns of location and object often overlooked in the rush of everyday tourism. His palette is as exotic as the places visited but nonetheless contemplative and dignified. Wilkinson’s journey was more influenced by science fiction and the natural world. 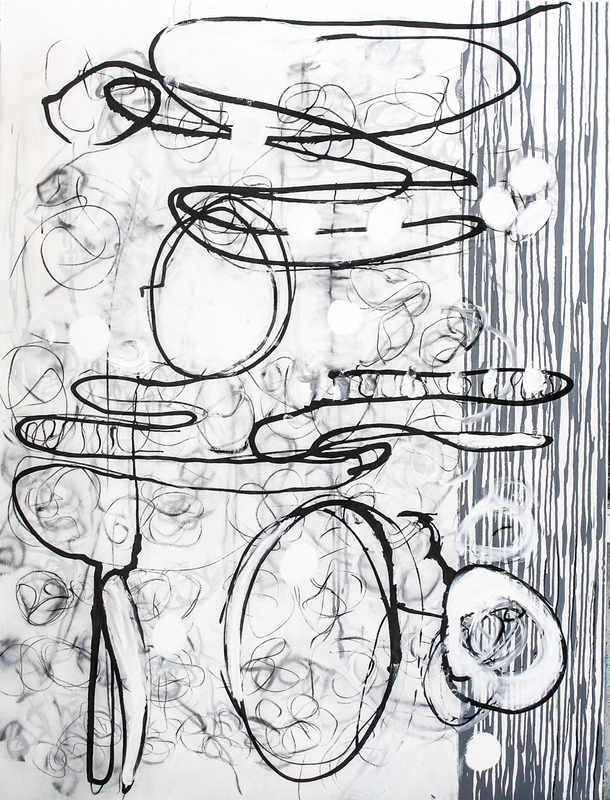 Her works explore her curiosity in the mysteries that lie beyond our senses. Comparatively speaking, her textiles appear more three dimensional, resembling quilting. Yet, in either case these two exhibits were the best examples of their craft and art. Which leads us to the next two exemplary members of the A-list: best sculptural exhibits of 2018 and again very different examples each: Trajectories by Justin Beller at Anderson O’Brien in the Old Market was a creative stretch for the artist, as it not only featured his sculptural towers which have achieved commercial and artistic success, but included new more figurative paintings that reflected a more introspective and personal vision. In fact, one could argue that his 2D work was some of the finest painting on view in 2018. 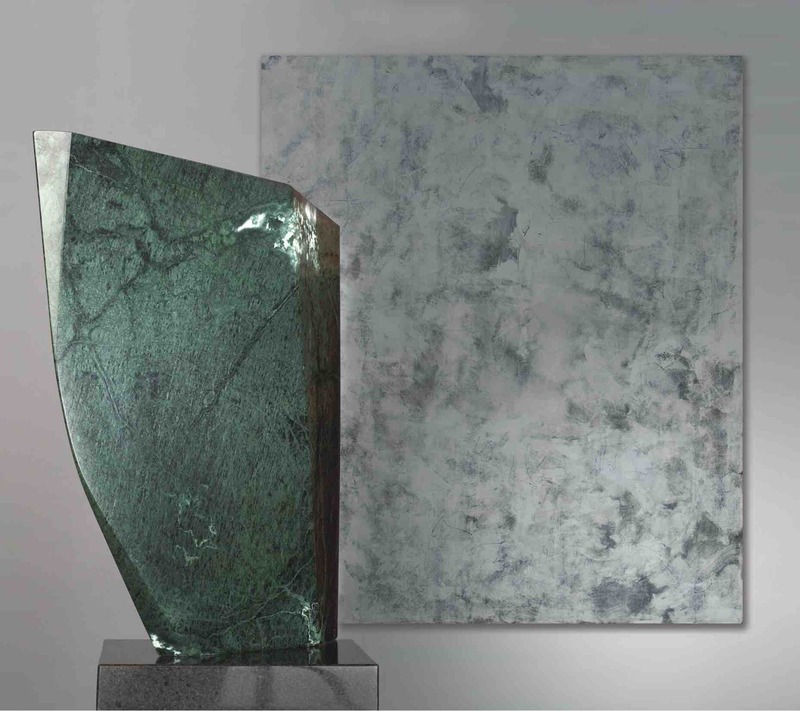 Stone by Sora Kimberlain was quite simply and elegantly one of the premier exhibits of the year, sculptural or otherwise. 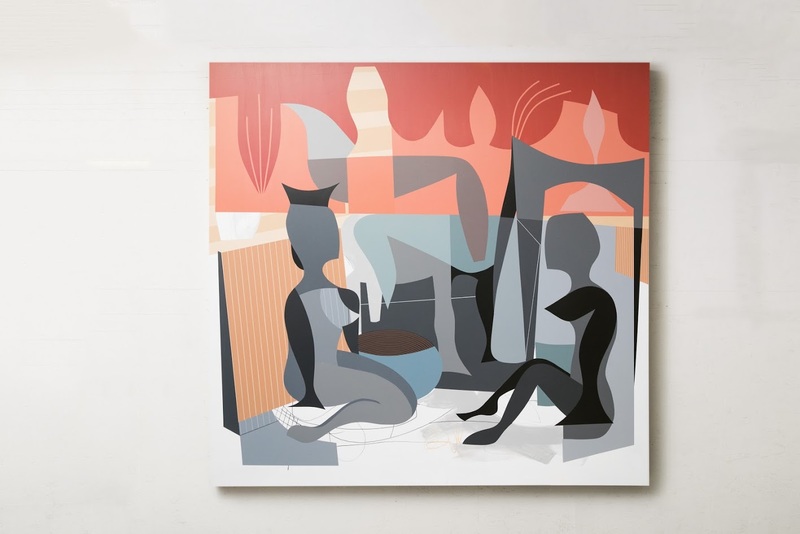 Back-dropped at Modern Arts Midtown with 2D work by Graceann Warn, Roberto Kusterle and Larry Roots, Kimberlain’s work is her finest to date. The show’s title understates it well, a beautiful combination of color, craft, texture and nature embodied especially in the balance and grace of Kimberlain’s unique approach and touch with her material. This was museum quality work, a shame the exhibit had to come down at all. 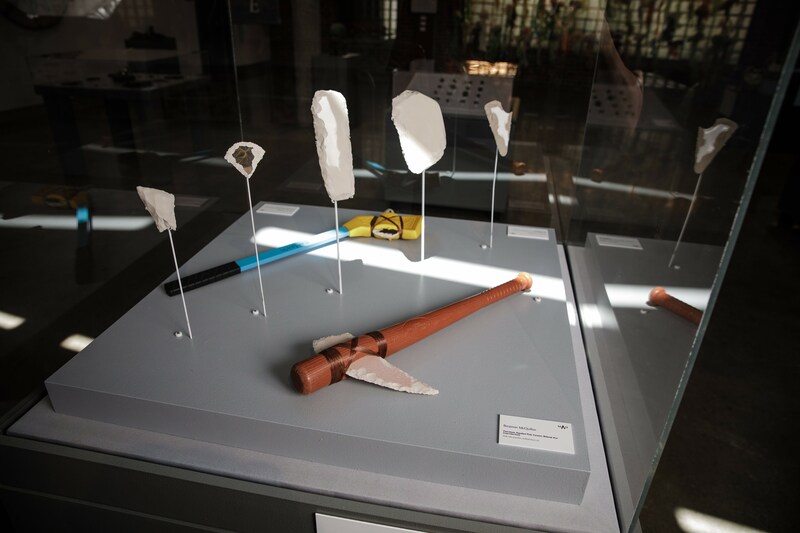 Two-person exhibits remain popular in the Metro, especially when there are connections and interplay between the works on display. Artist-curator Sheila Pepe organized the most intriguing and complicated example of this with her beginning.break.rapid exhibit at the Bemis Center. It featured the abstract wall sculpture of New Yorker Kenji Fujita and abstract paintings of Nebraska-born Barbara Takenaga that moved and spoke to another across the gallery as each flew in the face of traditional notions of beginning, middle and end. Photography played a major role in the Metro art scene again, thanks almost exclusively to exhibits in the Garden of the Zodiac gallery. Northern Light, platinum prints by Berlin artist Jens Knigge of his travels in Iceland and Norway, and French artist Isa Marcelli’s solo in the summer which featured dream-like portraiture and landscape that utilized historic darkroom techniques were fine examples. The same can be said for the two most significant and pleasing painting exhibitions of 2018, both of which showed at the Garden of the Zodiac. 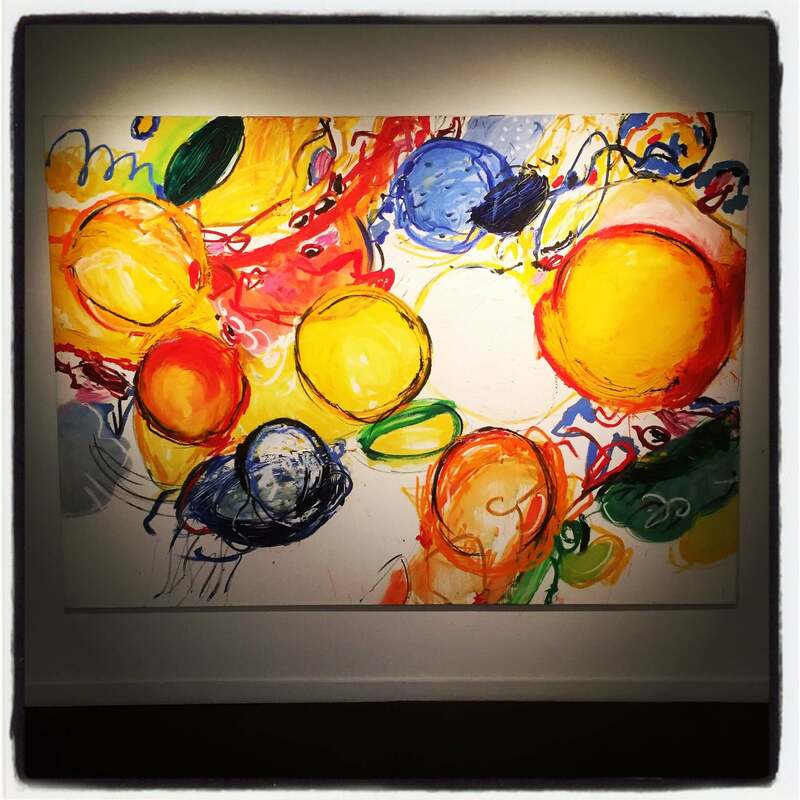 They were virtually a yin yang variation in theme and style: Circles on the Move by Berliner Christian Rothmann and Omahan Joe Broghammer’s solo of “animal magnetism.” Rothmann’s bold “flower power” abstraction was expansive, colorful and dynamic. His breathtakingly beautiful titular piece a prime example of his most mature exploration of his “energy balls” to date. In sharp contrast to Rothmann’s gestural work, Broghammer’s “beauty and the beast” exhibit illustrated the two sides of his vision and personality. Artfully rendered buffalo and owl portraiture, complete with his own personal iconography, graced the Zodiac, but not before the viewer encountered his wildly enigmatic signature scenarios replete with circus and carnival atmosphere and caricature. Group exhibits are even more difficult to curate, let alone review, but the two most satisfying large scale and scope exhibits of 2018 were Gallery 1516’s showing of MONA2Omaha: Nebraska Regionalist sand Kaneko’s multi-discipline Reality. The former was a comprehensive survey of major figures with ties to the state including Thomas Hart Benton and Grant Wood displayed side by side with impressive work from perhaps lesser-known such as Terrence Duren, Aaron Gunn Pyle and Dale Nichols. Speaking of provocative, in a culture inundated with selfies and self-indulgence, it’s refreshing, even inspirational for an artist to take the themes of selfhood and identity seriously and to turn it into a creative, revealing exhibit. 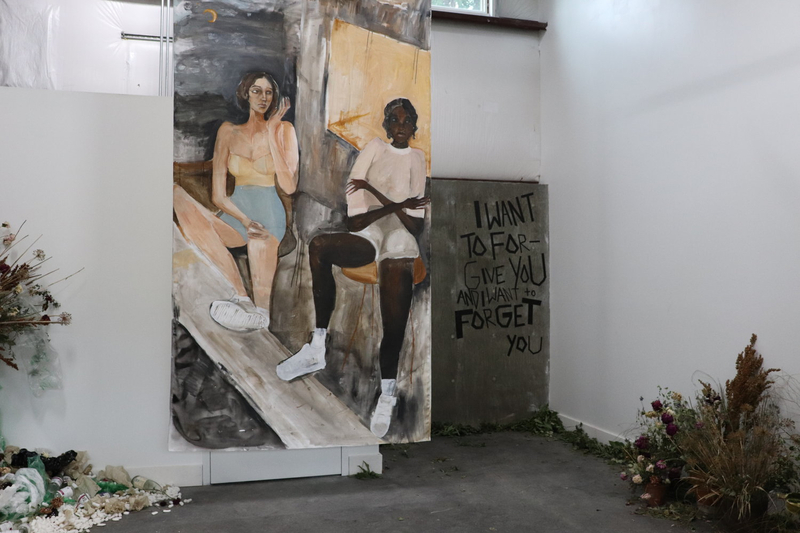 This is exactly what artist Zoë Charlton accomplished in her solo at the Wanda D. Ewing Gallery at the Union for Contemporary Art. Aptly titled The Ipseity Project, the exhibit featured drawings of model “body doubles” as a means of creating a holistic self-portrait. In retrospect then, if you missed any of the above exhibits, you missed much if not all of what 2018 had to offer by way of the best in visual art in the Metro. Reader’s free lance arts writers also weigh in with their favorite art exhibits in 2018. Shea Wilkinson’s Parallel Worldswas a highlight for me this year. Her work is consistently getting more and more fascinating and layered. She can make fiber do incredible things – from creating cavernous space to a watercolor effect. Another show I loved was at the Omaha Creative Institute, now known as Amplify Arts. 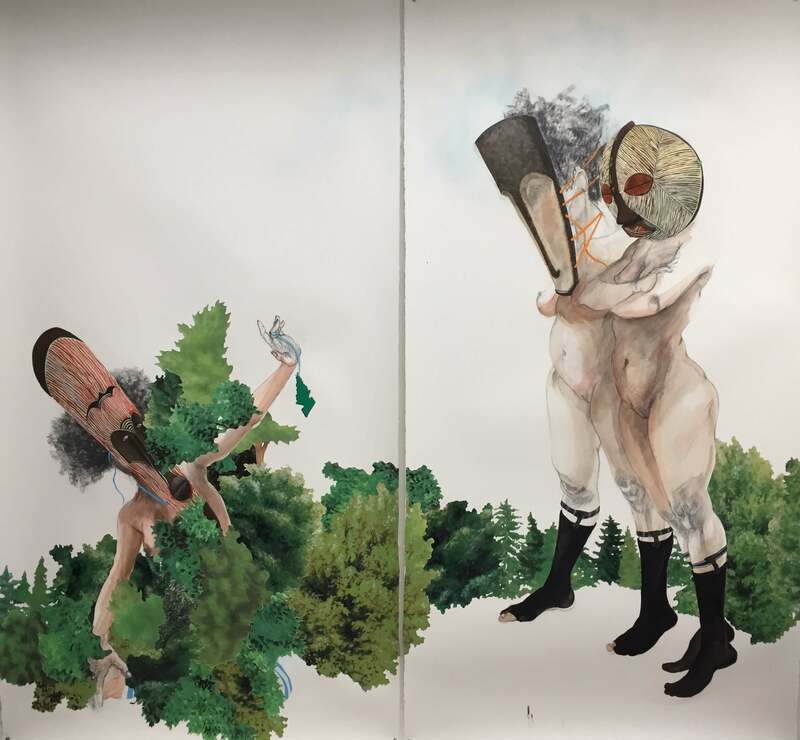 Lauren Conrad is Cryingfrom Carolyn Hoover and Rachel Shiller, curated by Slushie Cohen, offered up romanticism and quirkiness with a grand scale of installation, painting and drawing. It was wonderful to see a solo show by Federico Perez at Project Project with Lest We Forget. His richly detailed woodcuts within the stark black and white surface gives so much weight to such dark topics as WWI and the Armenian genocide. And one more work that needs mentioning is the piece “788401 Minutes: Music from the Inside” by Dominique Morgan as part of the Union for Contemporary Art’s Fellows Show. This installation brought to life Morgan’s experience during his 18 months in solitary confinement. Combined with narration performed by Morgan, the piece highlights his perseverance and resolve with music as the catalyst as well as forcing us to remember the humanity that exists in our prison system. Of note, Brian Gennardo’s exhibit at Modern Arts Midtown in January. 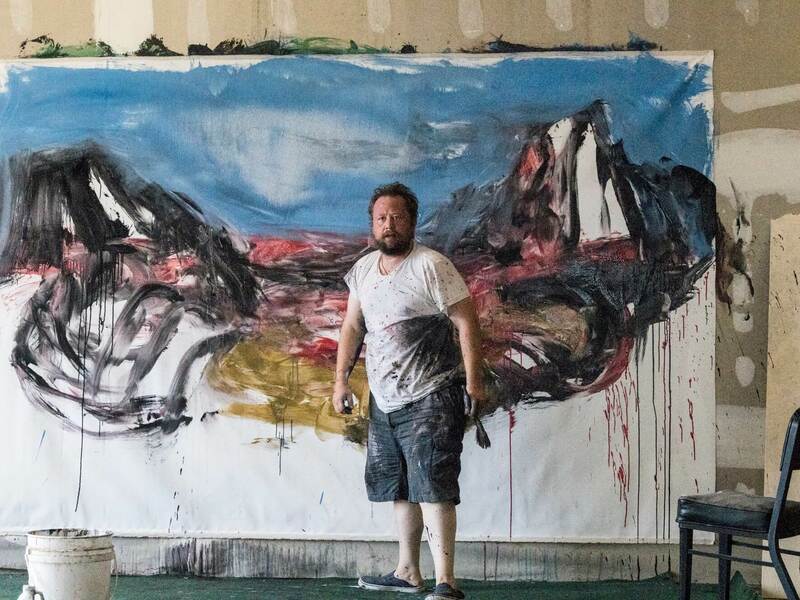 His expressive, gestural abstractions speak to both current affairs and universal concerns. Still anchored in his underground/ graffito origins, but and shows an evolution and maturity in subject and execution. Steve Joy, Gallery 72 – Paintings from the Forgotten Corner. Joy’s (mostly) newer works inspired by the historic portraits of Tudor England, painted in his studio home county of Cornwall, England. The enigmatic paintings, done over about a seven-month period, hint to the first origins of modern civilization, through allusion to science, mathematics and philosophy. Interesting juxtaposition of Joy’s signature use foils and translucent varnishes with modern, figurative line and symbol. Extra kudos to that welcome amalgamation of Nebraska’s finest of the Regionalist Movement, the MONA2Omaha presentation Nebraska Regionalistsat Galley 1516. An exciting, educational exhibit, featuring both the famous and the lesser-known, with a healthy inclusion of female artists; and a nice cross section from painting to print-making. Joseph P. Broghammer at Garden of the Zodiac – Diligence from the mind of one of the area’s most imaginative artists. Garden of the Zodiac brought together several of his recently popular owl “portraits” with a new group of bizarre set pieces, nods to his work from over a decade ago. Book-ended by large, traditionally-rendered Buffalo portraits, his work is highly-personal, and heavily decorated with his signature “charms” that are both openly symbolic and intriguingly cryptic. It may seem obvious that an art museum is capable of organizing a solid retrospective, but kudos to Joslyn for bringing overdue attention to the work of Ed Ruscha. The exhibition was pleasingly long on his trademark Pop-inflected fascination with verbal and visual language, and while regrettably short on his fantastic drawings, gave a broad view of this internationally regarded, Nebraska-born SoCal artist. Extra points for the Ruscha’s gratitude being recently expressed through a fantastic gift of select works by the artist and some of his contemporaries.